For all those aspirants who wish to work for Govt Jobs in Tripura, there is good news. Now your chances for getting job in the government sector have increased as you are provided updates of Latest Govt Job in Tripura and Current Govt Jobs in Tripura daily. Yearly the data of average jobs releases in the state is 45000+ at different levels of state and Central Govt Jobs in Tripura. To know complete information of them Chekrs is one stop. The candidates across the Tripura region who were wishing to work in reputed government sector don’t need to search the Tripura Govt Job News anywhere else. Whether a fresher or the experienced or even if you are looking for chance as per your qualification, at Chekrs you can find the best Jobs for 12th Pass, Engineer, MBA, Doctors, etc. To enjoy the service of receiving Tripura Upcoming Govt Job notifications for free, subscribe to the updates of jobs.chekrs.com. 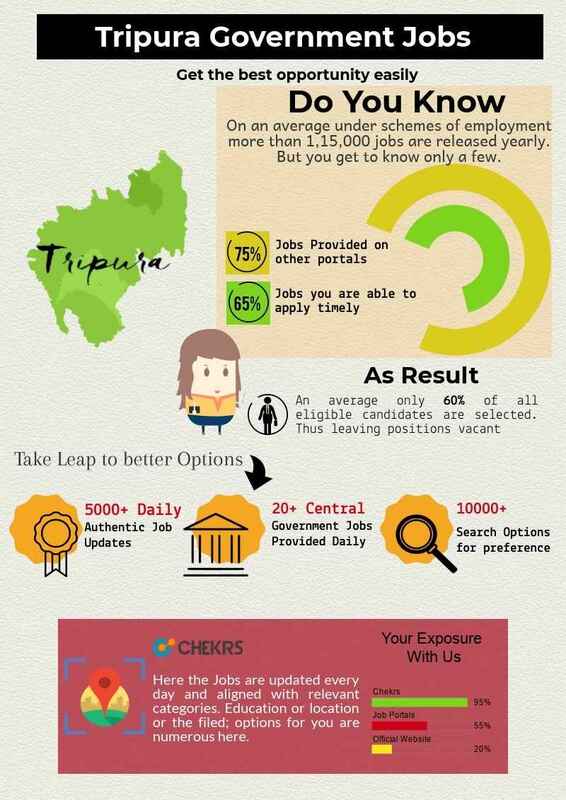 Why Chekrs for Upcoming Govt Jobs in Tripura? The selection in Tripura Govt Job Vacancy is not easy. For all of the positions the candidates has to go through the critical exams. If you want to get selected in these jobs you can rely on us. Here you are provided the complete study material such as previous papers, model and sample papers, free online mock tests and also the quiz.